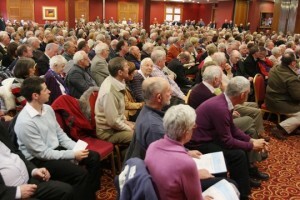 The Association of Catholic Priests will mark three years in existence on 29 October when it holds its AGM in Athlone. According to the group, the Athlone meeting will be an opportunity to take stock and plan of the future. One of the co-founders of the group, Fr Tony Flannery, has signalled his intention to stand down from his role as a spokesman in order to allow someone else take up his position within the organisation. Among the items on the agenda for the meeting are the possibility of two or three new people joining the leadership team. Members will also review the main developments over the last three years, and there will be two short presentations and contributions from the floor. Perhaps the most significant aspect of the meeting will be the presentation of the findings of a specially commissioned study on the Murphy Report, which reported on the mishandling of allegations of clerical sexual abuse in the Archdiocese of Dublin. The study has been carried out by a legal expert who has examined the findings of the report and the underlying legislation. A book by Pádraig McCarthy, entitled ‘Unheard Story: Dublin Archdiocese and the Murphy Report’, will also be presented at the meeting. Separately, the ACP and the Association of Catholics in Ireland (ACI) have organised for The Tablet’s Rome correspondent, Robert Mickens, to give an address in Dublin in November on Pope Francis. It will be the first event jointly organised by the ACI and the ACP. He said this vision promoted a Church where the role of the laity – women as well as men – is encouraged and enshrined at all levels in support of the bishops, priests and religious.